This song is an example of uber-cool indie electronic at its best, a trip backwards on an aural time machine. As the summer festival season kicks into high gear, the time is ripe for a return to the soulful basics of electronic dance music with songs grounded in the human element. 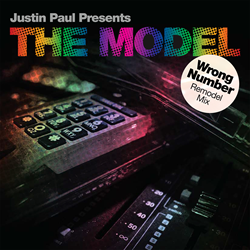 Justin Paul presents The Model’s “Wrong Number” is just that kind of release. As a skilled record producer, Justin Paul featuring Mark Richardson (aka The Model) bring listeners back to a time when disco gave way to new wave and ultimately to house music with the Remodel Mix. A time when all that mattered was the music. “Wrong Number” is a song that’s both retro and futuristic and it is out now. The Album Version of “Wrong Number” is an icy cool nod to the best of ‘80’s synth pop. This song is an example of uber cool indie electronic at its best, a trip backwards on an aural time machine. The chilly timbre of The Model’s voice lends the song a mod panache and it would be at home at a New York Fashion Week afterparty. Justin Paul’s production skills make the “Wrong Number” Remodel Mix feel urgent, upfront, undeniable. The cold command of the synthesizers veers towards electro as visions of tastemakers in skinny ties and Debbie Harry lookalikes dance across the mind’s eye. Imagine scenes of porcelain-skinned, impeccably dressed, Hollywood A-listers and Andy Warhol dancing in silhouette. The Remodel Mix is characterized by the signature synth intro accompanied by an alert beat. The break on this edit builds with more fury than on the Album Version. The Remodel Mix stands out for being positively hypnotic and the listener is completely drawn in and under the influence. Justin Paul is a DJ, producer and co-founder of the Underground Sol imprint. Mentored and inspired by house music luminaries King Britt, Dozia Blakey and Josh Wink, Paul founded Playloop, a successful event promotions company and record label, in 2006. He became well-known as a DJ and promoter in Philadelphia and Los Angeles and he’s one of the original members of Philadelphia Experiment, a collective of creators, musicians and visual artists. As a DJ, Justin Paul has shared the stage with Deadmau5, Air, The Prodigy, Thievery Corporation, Trentemøller, Zero 7 and others. The Model (Mark Richardson) is an artist previously signed to Elektra Records. For more information on Justin Paul pres. The Model and Underground Sol, Andrew Rayel, MaRLo, Giuseppe Ottaviani, Sylvia Tosun, Traveler, and artists like Armin van Buuren contact EMILY TAN Media Relations (U.S.), +1(917) 318-3758, EmilyEmilyTan(at)aol(dot)com. Follow EMILY TAN Media Relations on Twitter @EmilyEmilyTan and LinkedIn http://www.linkedin.com/pub/emily-tan/4/342/70b.